When getting corporate clothing printed or embroidered, you want to know it's going to look good and last for ages. That's why we print everything with top quality inks and embroider clothes with state-of-the-art machines in up to 15 colours. By far the most popular choice for corporate workwear is the polo shirt. Smart, comfortable, great value without looking cheap, easy to work in and easy to wash.
We can print or embroider your company logo on your shirts - or use a combination of processes to achieve a professional company workwear image. For outdoor work, and casual uniforms, fleeces, jackets and hoodies will keep your workforce warm as well as keep a consistent and recognisable company image. Browse clothes for printing. Our catalogue includes a wide range of workwear which you can customise and personalise. See workwear clothing. Whether for a sales promotion, exhibition, charity or other special event, promotional clothing can deliver your sales message and increase awareness of your brand and generate new sales. A professional, consistent image is important. So is long lasting value. We deliver all of this with a wide range of formal work uniforms suitable for almost any kind of business. 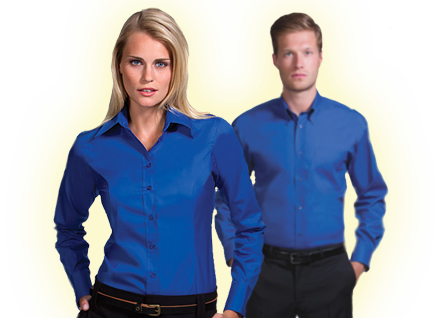 Browse corporate clothing for printing and embroidery. "I was really impressed with your work and would like to make another order with you."